Let's conquer the virgin blue! Sometimes the ideas for Soviet Posters seem to be quite hilarious. Take this one from the sixties. 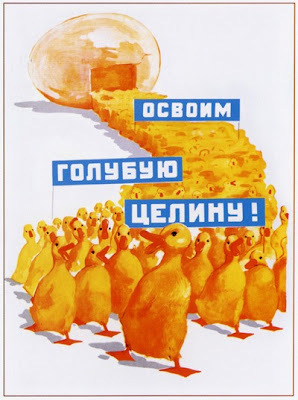 It shows a great number of ducklings, who carry slogans which say: “Let’s conquer the virgin blue!” They are proceeding from a giant egg, moving in a horde like soviet workers at an October demonstration. Their main goal according to the slogans is to live and increase its weight on the water. In reality lots of soviet young people were cultivating the virgin soils which were considered to be the main source of extensive development of agriculture. At that time lots of “advanced” means were tested like planting of maize corn everywhere including areas near the polar circle, general breeding of rabbits or in this very case the duck farms building, which was considered to be a perfect way of getting plenty of cheap meat for the people. Needless to say that all the efforts were in vain: the corn didn’t seem to grow according to forecasts, and moreover Soviet people were not eager to choose it instead of wheat bread. The rabbits and ducks although breeding well and fast were prone to epidemics and required lots of food to grow. These were some of the failures in agricultural development which lead to Khrushchev’s forced retirement in 1964.